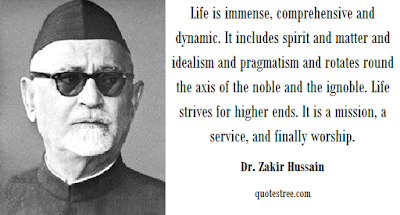 Dr. Zakir Hussain was the 3rd President of India from May 13 1967 until his untimely death. He was an educationist by profession. Our sweat is the answer to all our problems, and that the tiller, the artisan and the teacher are the three agents who feed the body, mind and soul. I have after years of thinking on the subject come to the conviction that work is the only instrument of effective education. Life is immense, comprehensive and dynamic. It includes spirit and matter and idealism and pragmatism and rotates round the axis of the noble and the ignoble. Life strives for higher ends. It is a mission, a service, and finally worship. For God’s sake, reform and improve the politics of our country. I maintain that education is a prime instrument of national purpose and that the quality of its education is inseparably involved in the quality of the nation. Placed under the sway of conflicting urges of the Indian masses we are yet given the poetic quality of composing a harmonious life. There are thousand stands of culture that make of the cultural life of our people a variegated pattern of exquisite beauty and richness. Had your mother not been so well-organized, so simple, so virtuous and so resourceful, I would not have been what I am today. Education is the master and politics is its servant. It is necessary to combine power with morality as well as with science and technology. Streams of ideals that originated in the summit of our past, flowing underground in the depth of India’s soul, the ideals of simplicity of life, clarity of spiritual vision, purity of heart, harmony with the universe and consciousness of the infinite personality in all creation and the urge to bring these to the surface of our daily use and purification. I may be forgiven the assumption that my choice to the highest office is mainly, if not entirely, made on account of my long association with the education of my people. To seek to exclude any of these because of age or association with some particular elements of our national being would almost be an act of treason. In the rich history of our country nothing is good or bad because it is new or old...Hindu, Muslim, Sikh, Christian or Parsi. Such an environment of love and affection (at school) had not as yet allowed my life to be exposed to hardships. Depending on others was my habit. You will be surprised to know that prior to my journey to the college I had never bought a train-ticket myself...the very first day I realized that moving out of the controlled school life and stepping into the free college life is no less than inviting all sorts of hassles to yourself. Nobody tells you how to read. Nobody tells you what to do, where to go, when to sleep, and when to wake up. The one who is used to restrictions gets perturbed by this freedom. The aim of a student’s life should be to overcome any illusions or prejudices he may have and to give up mean habits. He should, and it is his duty to, propagate education among his illiterate brothers and to consider the propagation of education as part of his own education. He ought to acquire knowledge for the sake of knowledge and he should not be unaware of the needs of life. The edifice of my educational thought is almost entirely beholden to the views of Kerschensteiner. At later stages, however, Gandhiji’s influence and his elaboration of some of the finest points on the subject provided the much needed depth and expansion. Words turned into projects and a mere conceptual and transient framework became an insuperable part of my life. Politics, especially in our country, is like a mountain stream which suddenly overflows and soon recedes, while educational work flows not only during monsoon but also in the summer by melting the hearts of mountains. Politics is concerned with the strengthening of national existence and is impatient by nature, education is dedicated to social ideals, it is inherently patent. Which is why education is the master and politics its servant. It seems that institution has a great role to play in the development of India’s national life. Were I not convinced of this I would not have come to Aligarh leaving the Jamia work, to which intellectually and emotionally I am so deeply committed. Our country does not need warm blood oozing out from our necks, but it needs the sweat of our brow that would flow twelve months in a year. The need is great for work, serious work. Our future would be made or marred by the broken hut of the farmer, by the dark roof of the artisan, and by the straw school of a village. It is possible to settle the disputes of a day or two in political strife, in conferences and congresses, but those places which I have indicated have been centuries the centers of our destiny. Work in these areas requires patience and perseverance. It tires you much and it is thankless too. It does not yield quick results; but yes, if someone holds on for long, it would give him sweet fruit. Feeble beliefs must be replaced by healthier habits and irrelevant institutions by progressive institutions. Our will should get guidance not form the twilight of the intellect but from the broad daylight of true beliefs.